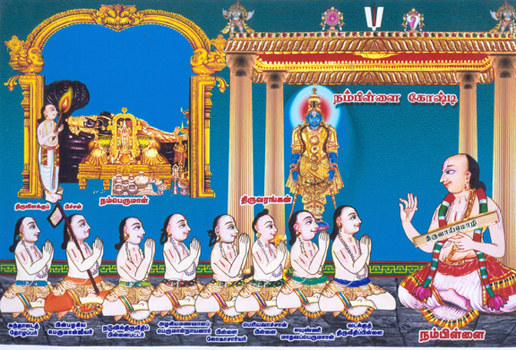 Works: thiruvAimozhi 125000 padi vyAkyAnam, pishtapasu nirNayam, ashtAkshara dhIpikai, rahasya thrayam, dhvaya pItakkattu, thathva vivaraNam, srIvathsa vimsathi, etc. He is said to be the son or the grand son of parAsara bhattar. He was named as uththaNda bhattar and later becomes to be famously known as naduvil thiruvIdhi piLLai bhattar. Note: It is stated that he is the son of parAsara bhattar in periya thirumudi adaivu and he is identified as the grand son of kUrathAzhwAn in 6000 padi guru paramparA prabhavam. In pattOlai, he is identified as the great grand-son of vEdha vyAsa bhattar. There is lack of clarity about his identity – neverthless he becomes to be a dear sishya of nampiLLai. nampiLLai‘s period in srIrangam is said to be the most glorious and golden period for srIvaishNavam in srIrangam due to continuous bhagavath anubhavam without any disturbance. nampiLLai had great number of sishyas and followers who were regularly attending his kAlakshEpams. naduvil thiruvIdhi piLLai bhattar did not have a favourable attitude towards nampiLLai though. Due to his rich family heritage he developed pride and did not respect nampiLLai initially. Once, naduvil thiruvIdhi piLLai bhattar was going to the king’s court. He meets pinbhazhagiya perumAL jIyar on the way and invites him along to attend the king’s court. Since jIyar had great respect for bhattar for his family heritage, he accompanied him. The king receives them, honours them and offers them a nice seat. The king being well learned, wanting to test the intelligence of bhattar, asks him a question from srI rAmAyaNa. He says “srI rAman himself claims that ‘He is just a human being and is the dear son of dhasarathan’. But during the last moments of jatAyu, srI rAman benedicts him to reach srIvaikuntam.So, is this not contradictory?”. bhattar was speechless and could not respond with any meaningful explanation. Incidentally, the king gets distracted by some other task. At that time, bhattar turns to jIyar and asks him “How would nampiLLai explain this?”. jIyar replies “nampiLLai explains this using ‘sathyEna lOkAn jayathi‘ slOkam” which means a fully truthful person can control all worlds – so just by truthfulness alone he was able to conquer all worlds. bhattar, himself being intelligent, explains that to the king, when the king focusses back on them. The king, being intelligent as well, at once agrees to the principle and honours bhattar with great wealth. bhattar, with great gratitude/reverence towards nampiLLai, asks jIyar to connect him with nampiLLai, at once goes to nampiLLai’s residence and submits all the wealth given by the king at the lotus feet of nampiLLai. bhattar says to nampiLLai that “I received all these wealth for just 1 small explanation from your teachings” and offers them all to nampiLLai himself. He then tells nampiLLai that “all along I have lost the valuable association/guidance of yourself. From now on, I will ensure that I will serve you well and learn the sampradhAyam principles from you”. nampiLLai embraces bhattar and teaches him all the essence of our sampradhAyam. nampiLLai teaches thiruvAimozhi to bhattar fully. bhattar hears them in the morning, contemplates on the meanings and documents them in detail every night. Once the lecture series is over, he submits his writing at the lotus feet of nampiLLai. nampiLLai, observes the detailed documentation of thiruvAimozhi to the length of 125000 padi (similar in size to mahAbhAratham). nampiLLai becomes worried that if there was such detailed documentation, people will ignore the guru-disciple teaching/learning methodology and will just read the book and start coming to their own conclusions. nampiLLai explains to bhattar that when piLLAn did 6000 padi (similar in size to vishNu purANam) vyAkyAnam, he first took the permission of emperumAnAr. But in this case, bhattar did not get the permission from nampiLLai to write the vyAkyAnam. Though bhattar replies saying he only documented what was said by nampiLLai and did not write anything on his own. Finally, nampiLLai does not agree to release that grantham and destroys the same. (Note: According to this incident here identified in yathIndhra pravaNa prabhAvam, when AchAryan passes away, sishyas/sons are supposed to shave their heads while others who are surrendered to him (not direct sishyas) are supposed to shave facial and bodily hair). When nampiLLai ascends to paramapadham, naduvil thiruvIdhi piLLai bhattar shaves his head as sishyas are supposed to do. A brother of bhattar becomes upset at his act and complains to him saying why should some one born the family of kUrathAzhwAn, shave the head for nampiLLai’s ascending to paramapadham. bhattar replies to his brother sarcastically “Oh! I have insulted the lineage of kUrEsar. How are you going to rectify this?”. bhattar’s brother, unable to take those sarcastic words, goes to namperumAL and complains to him about bhattar’s act. namperumAL summons bhattar and asks him through the archaka “When I am alive why did you do this?” (perumAL considers himself the father to parAsara bhattar and his descendants). bhattar responds “Please forgive me for my act”. He continues “Actually, I should have shown total surrender to nampiLLai which is the natural quality of any one coming in the lineage of kUrEsar (to be surrendered to srIvaishNavas) and shaved my facial/bodily hair. Instead I only shaved my head which shows that I am just doing the minimal anushtAnam for a sishya/son. Are you being upset with me for just doing the minimum respects?”. Hearing this, namperumAL becomes very pleased on the dedication of bhattar towards nampiLLai and honours bhattar with thIrtham, garlands and vasthrams. Such was the glories of naduvil thiruvIdhi piLLai bhattar. thiruvAimozhi – 9.3 – nampiLLai eedu pravEsam (introduction) – In this padhigam, nammAzhwAr brings out the glories of nArAyaNa nAmam (and manthram). There are mainly 3 vyApaka manthrams (those manthrams that exhibit bhagavAn‘s omni-presence) namely ashtAksharam (Om namO nArAyANAya), shadaksharam (Om namO vishNavE) and dhvAdhasAksharam (Om namO bhagavathE vAsudhEvAya). naduvil thiruvIdhi piLLai bhattar says that the meaning of praNavam, the meaning of nama:, bhagavAn‘s omni-presence, etc are revealed in all 3 vyApaka manthrams but AzhwAr‘s heart is close to nArAyaNa manthram. Note: This importance of nArAyaNa manthram is further emphasised by piLLai lOkAchAryar in the beginning of mumukshuppadi. In vArtha mAlai, a couple of incidents involving naduvil thiruvIdhi piLLai bhattar are identified. 216 – naduvil thiruvIdhi piLLai bhattar quotes a beautiful conversation between nampiLLai and pinbhazhagiya perumAL jIyar. jIyar asks a question “Every mumukshu should be like AzhwAr (fully depending on emperumAn and contemplating on emperumAn only). But we still have material desires. How will we get the same result (kainkarya prApthi in paramapadham) that AzhwAr got?”. nampiLLai answers “Even though we may not have the same advancement like AzhwAr in this sarIram, by the grace of our AchAryan who is pure, bhagavAn will create that same desire (as that of AzhwArs) in us between the time we die and we reach paramapadham. So, by the time we reach parampadham we will be fully purified and will only have the desire to do kainkaryam to emperumAn eternally. When observing faults in samsAris (materialistic people), since we are not all-capable like bhagavAn to reform them, we should simply ignore them. When observing faults in sAthvikas (srIvaishNavas), since they are fully dependent on bhagavAn and so they are capable of curing their faults by the grace of bhagavAn, we should simply ignore them. Just like a person applying chemicals on his body can behold fire without getting hurt, we should be covered with bhagavadh gyAnam so we are not affected by the material desires and issues. We should have two aspects of knowledge – a) we should have great desire to reach paramapadham which is fully spiritual and b) we should have great desire to be fully relieved from this samsAram (which is the place holder of ignorance). Still, our knowledge about this samsAram being the place of ignorance is most important, since even if we have a tinge of attachment in samsAram, that will pull us down and keep us here itself. Thus, we have seen some glimpses of the glorious life of naduvil thiruvIdhi piLLai bhattar. He was a great scholar and was very dear to nampiLLai. Let us pray at his lotus feet that we too get a little bit of such bhAgavatha nishtai. This entry was posted in other AchAryas on April 20, 2013 by sarathyt.